Disjecta presents Score., a new installation by Avantika Bawa. "Score. 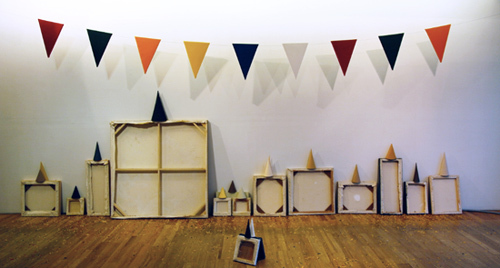 explores the making, breaking and rearranging of rules, strategies, structures and histories. Examining the past use of Disjecta's building, Bawa amplifies the working mechanism and occasional failures of systems through the creation of an abstract and altered Bowling Alley." Tonight's free lecture with Mary Ellen Mark's is presented in conjunction with her first solo exhibition in Portland at Blue Sky Gallery, featuring original prints from three remarkable bodies of work: Falkland Road, Indian Circus, and Ward 81 (made at the Oregon State Hospital in Salem in the mid-1970s). It's one of the best shows in Portland right now so don't miss this. According to the Press Release,"Mary Ellen Mark is today recognized as one of America's most respected and influential photographers. She is a contributing photographer to The New Yorker and has published photo-essays and portraits in such publications as LIFE, New York Times Magazine, Rolling Stone, and Vanity Fair. 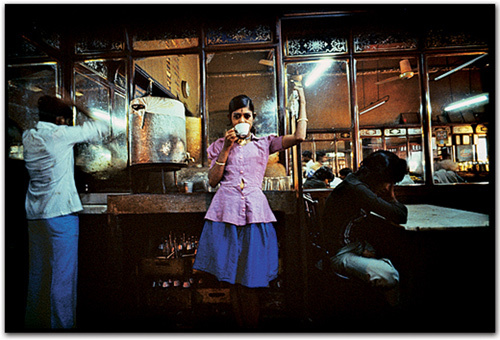 For over four decades, she has traveled extensively to make pictures that reflect a high degree of humanism. A photo essay on runaway children in Seattle became the basis of the Academy Award-nominated film Streetwise (1984), directed and photographed by her husband, Martin Bell." This one might be too late, but students know how to work under tight deadlines. 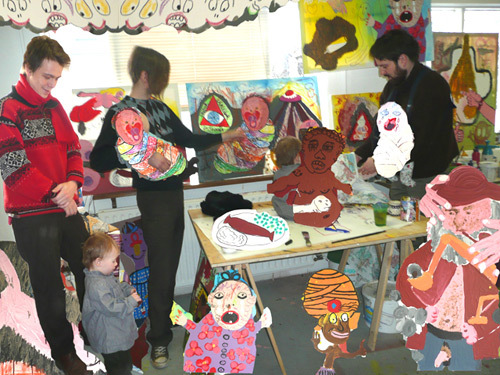 The Kimball Art Center in Utah is seeking applications for the Relevant 2011 artist-in-residency program. It's open to college and graduate-level art students around the country and includes in-studio sessions with mentors, panel discussions and art world networking events. Applications are due April 1. Get more information on their website. Evertt Beidler, video still from "Moves Manager"
PCC's Northview Gallery presents Moves Management, an exhibition of two kinetic works and a short film titled Moves Manager. Beidler says: "The kinetic sculpture and film that is featured in the show are intended to address the sense of purpose many of us derive from the work we undertake as professionals seeking to earn a living. 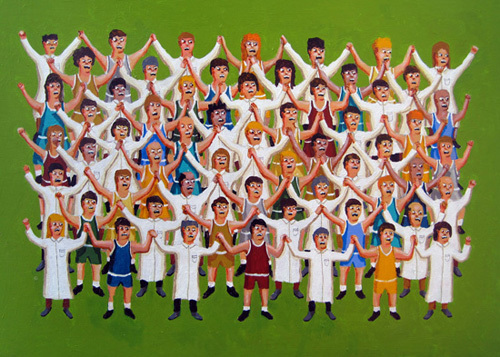 The works employ humor, irony, and honesty to provide the viewer with a glimpse into the monotony and often repetitious actions that are required in the pursuit of long-term goals." 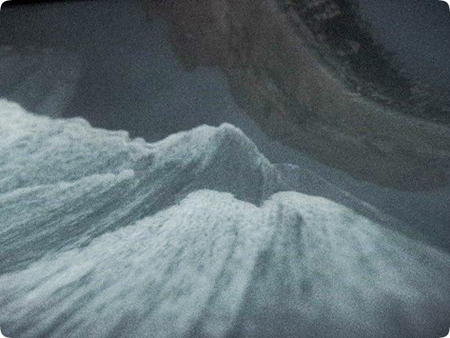 The show will be on view through April 29, 2011. PSU presents a lecture by Ralph Pugay, "a Portland-based artist whose work revolves around the idea of contradiction and its relationship to different kinds of human alienation--their root causes, and symptoms." The lecture is sponsored by the PSU Art Dept Diversity Committee. Note: This is today. 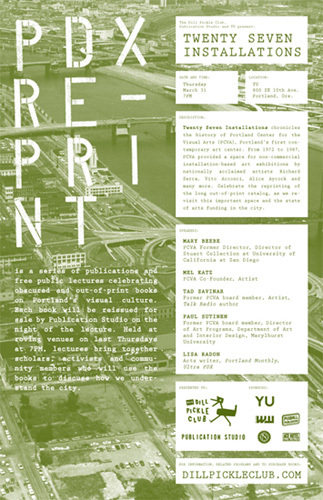 The Dill Pickle Club & Publication Studio are collaborating on Re-Print, "a series of four publications and free public lectures celebrating obscured and out-of-print books on Portland's visual culture." The first one is built around the book Twenty-Seven Installations, which chronicles the history of the Portland Center for Visual Arts (PCVA). Lisa Radon will lead a panel discussion by former PCVA director Mary Beebe, PCVA co-founder Mel Katz and PCVA board members Paul Sutinen and Tad Savinar. Lecture is sliding scale $0-$10 and a re-print of the book will be on sale. Note that this is at the much-anticipated Yale Union laundry building. An excellent look at one of the most excellent things on the planet, the Maison de Verre in Paris with excellent photos by Todd Eberle. I use the word Love sparingly... I Love this building, definitely check out Eberle's slideshow. 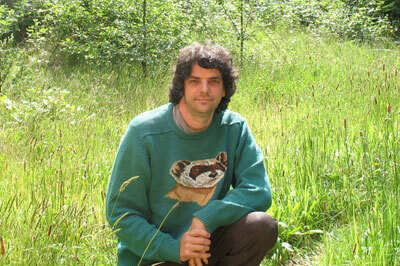 Joe Thurston wins a Pollock Krasner Grant, congrats. Portland's Bürgermeister Sam Adams presents Berlin's Bürgermeister with works by Damien Gilley... who is having a hell of a month. The Japanese Garden will be exhibiting ikebana in their pavilion this weekend. "Ikebana, the traditional Japanese art of flower arrangement, is both an ancient and modern art. In basic form, an ikebana arrangement follows a fixed pattern: a triangle of three points representing heaven, earth, and man. Emphasis is placed on linear perfection, color harmony, space, and form." 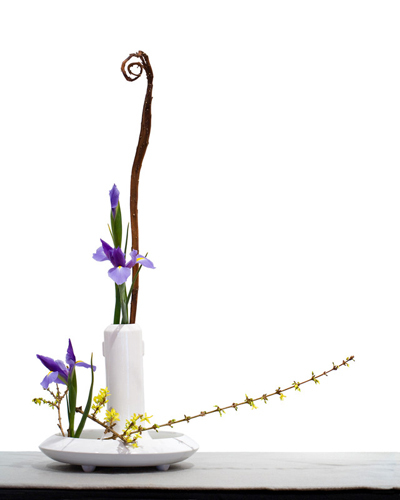 Click on the link below to see more ikebana-related shows coming to the garden this spring & next fall. 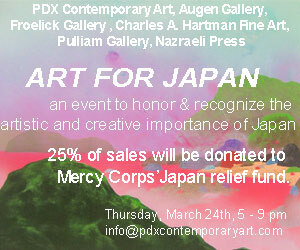 Tonight, during this horrific crisis for Japan; Augen Gallery, Froelick Gallery, Charles A. Hartman Fine Art, PDX Contemporary Art, Pulliam Gallery and Nazraeli Press are doing an event that honors and recognizes the artistic and creative importance of Japan. In many ways Portland is closer to Japan than say London. This one night event will to raise money for Mercy Corps' Japan relief fund. Each participating gallery will have on view and for sale art by represented Japanese artists and artists who feel they have been influenced by Japanese culture. 25% of sales from this event to Mercy Corps/Peace Winds Japan. Probably Portland's most well-liked citizen/experimental filmmaker, Matt McCormicks debut feature Some Days are Better Than Others, which stars indie rock royalty/Portlanders James Mercer and Carrie Brownstein of the now defunct Sleater-Kinney will open the Hollywood Theater on March 25th before opening wider across the country. Show up and let's try not to passive aggressively hate on someone who actually has done something ambitious (which is kind of a Portland tradition that everyone of note in this city is familiar with). Yes, Brownstein has done other things, like being trounced on Beulahland trivia night by my old team of critics, lawyers and economists (It shouldn't sting, but for any Portlander it would, I'm mean losing to critics and economists??? the shame!) Then there is her Portlandia series, which helps give Portland credit for things that also happens other in places... so it's a kind of indie-imperialist propaganda machine. More importantly Some Days was selected to play New Directors/New Films, the prestigious film series organized by the Film Society of Lincoln Center and the Museum of Modern Art (MoMA). The Hallie Ford Museum at Willamette University is currently showing Glory of Kings: Ethiopian Christian Art from Oregon Collections. 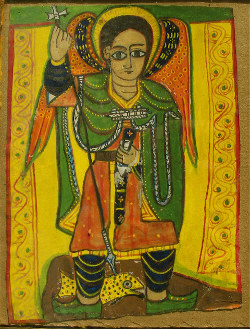 The exhibition features Ethiopian icons, illuminated manuscripts, magic scrolls, icon and cross pendants, and handheld and processional crosses that serve as visual expressions of the Ethiopian Christian faith and ritual practice. In conjunction with the show, Ethiopian art scholar Marilyn Heldman will lecture on the Ethiopian site of Lalibala on March 31 at 7:30 p.m. in the museum's Roger Hull Lecture Hall. I've lived in the Northwest since infancy, raised among its persistent rains and startling sunsets, dense wildlife and endless trees. Now for the first time, I'm on the cusp of a probable move away from my beloved Cascadia. So it was particularly poignant for me to settle into the couch in Matt McCormick's studio to watch The Great Northwest, a 75 minute ode to change, timelessness, natural beauty and the intangible experiences that define this region. "Legendary" avant-garde filmmaker Ernie Gehr will be in attendance at multiple screenings of his work this week at Cinema Project. Gehr's work "draws its energy from the carefully defined limits that structure his every film, a controlled restriction of the cinematic apparatus that, in a seeming paradox, results in incredibly exhilarating and even liberating films." 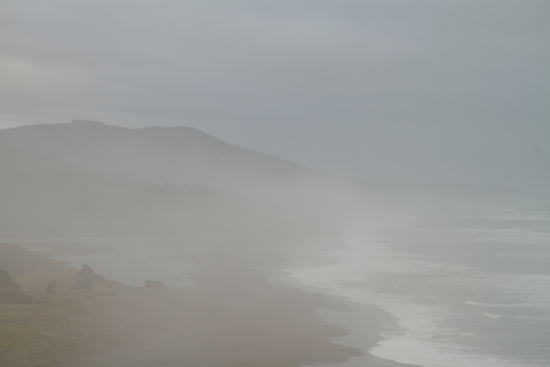 Jessica Lack looks at contemporary art that makes massive natural disasters its subject matter. Los Angeles has a new Museum to the Holocaust. I like how the bone/plant like structure is built into the landscape. In case you haven't heard already, Richard Prince has lost the first round of his claim of fair use in appropriating the images of others. There will be an appeal. Overall, I'm against the idea that someone could take a body of artwork by another artist and through minor levels of defacement claim it as their own artwork. In my mind advertising is different. It had a different intended use, whereas art thrives on the ambiguities it calls forth. 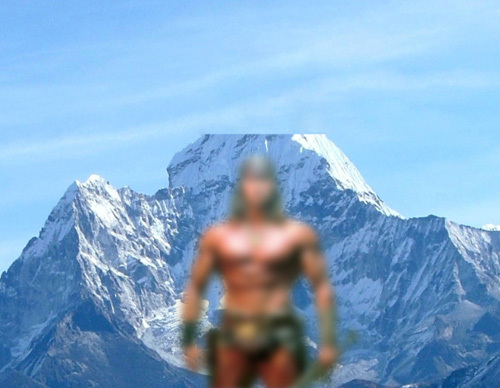 Any art made from it would rely on those same ambiguities to varying degrees. In Prince's case he relied on the other artist's work far too much, essentially pantomiming the original photos. It just isnt enough to call it new work. Lastly, Prince is essentially an artistic vampire... that's fine but why prey on another fine artist? Sure Picasso did this all of the time but he didn't lift photographs, mildly deface them and call them his own. Photography is easy to appropriate so I believe using them in such a way invites a legal decision if one isn't careful. I also believe Prince knew this was the likely outcome and saw it as a way to keep what I call his "relevant pirate" reputation up to date. 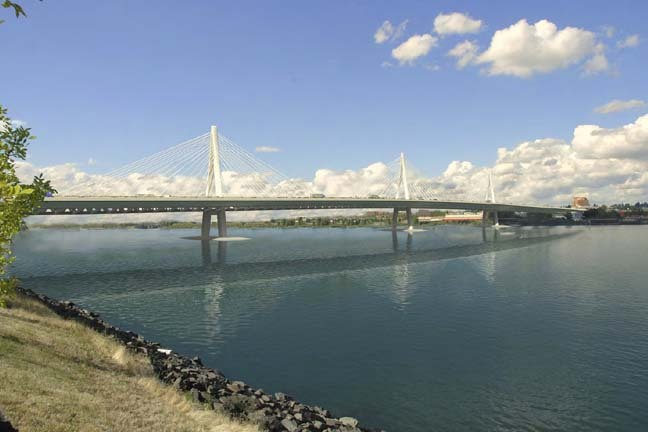 Last night Mayor Sam Adams (in an open letter to Governor Kitzhaber) proposes a closer look at the cable stayed design for the CRC. Notably in 2008 Adams singled an early article I wrote in one of his own blog posts regarding the need for good design and perhaps an iconic one (this letter suggests he's holding to that goal). The process has been backwards but there is a reason the cable stay is a popular design option... not the cheapest or the most expensive but perhaps the smartest (seismic, environmental and iconic) bang for the buck. As I mentioned earlier this week the cable stay design keeps gathering momentum (the deck truss design is abysmal and wont get local support). Another thing to consider is the need for a good designer to make certain the details of this hugely expensive project are developed and executed well. This isnt a luxury folks, simply a way to ensure that we and those who live here after us get the most for the inherently expensive price of such a project. Extra profit taking by skimping on details for transit projects is hardly a new or rare thing, a designer brings a certain quality control. Still, with seismic concerns and the overall rickety design of the current bridges (which lack max trains) I believe we need a new bridge. It will bring jobs and I feel the Federal Government needs to become a more major funder in this I-5 project. This isn't just a bridge between Portland and Vancouver, it is a bottleneck on I-5 that is dangerous in a major seismic event, and clogged during normal operation conditions. It could transform the way Portland and Vancouver interract if done well. Pulitzer Prize winning photographer Brian Lanker died in Eugene last Sunday at age 63. Known for his portraits of civil rights leaders and poignant on the scene snaps, he gets a nod from the New York Times. The Gaurdian discusses a fascinating historical exhibition about filth, called Dirt. Even Europe is making cuts on contemporary art and Daniel Buren speaks out. Le Corbusier's Chandigarh is threatened, help protect it. Artists and curators boycott Guggenheim Abu Dhabi. 1218 Boatspace presents Chase Biado's Sad Barbaric, described by a conversation between a slug and a gnat. Mack McFarland, "Well there ain't nobody left to impress / And everyone's kissing their own hands / (material of things unsaid)"
There's a second reception for IN(ter)DEPENDENCE at Place and Trade this weekend featuring performances curated by Recess Gallery. Also, audience members who participated in Shawn Patrick Higgins' Video Story Booth can see videos of first injuries as told by them. The show is up through March 31. 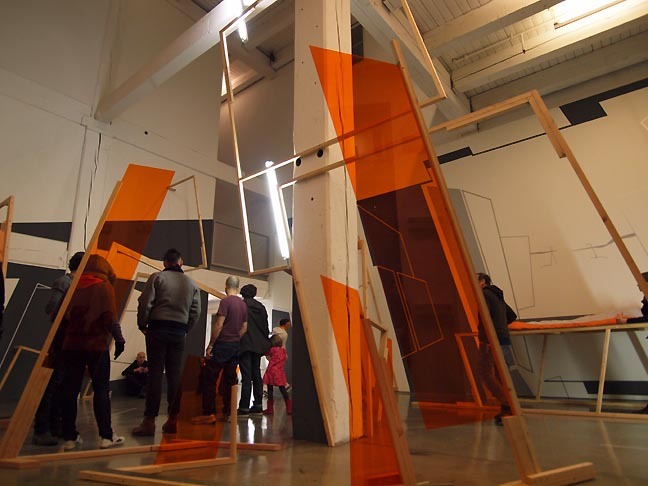 I can't recall a time a young emerging artist has hit Portland as hard and often as Damien Gilley has... and in March 2011 he just doubled down with 2 major shows at W+K and Linfield Gallery. He's one of several artists (Jordan Tull, Josh Smith, Eric Franklin and Gilley) with shows up this month that I wish to discuss. Close deadline: PICA's third annual Low Lives exhibition is still open for submissions. The project is "an international exhibition of live performance-based works transmitted via the internet and projected in real time at multiple venues throughout the U.S. and around the world." Submissions are due March 20, 2011. Get started on the Low Lives website. 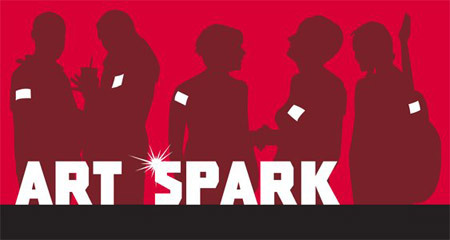 This month's Art Spark is featuring ORA: NW Jewish Artists in celebration of Jewish Arts Month. The Museum of Contemporary Craft presents Laurie Herrick: Weaving Yesterday, Today and Tomorrow. 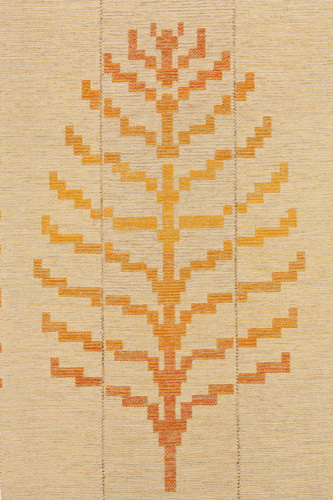 "Portland-based designer-craftsman Laurie Herrick created widely recognized weavings from the 1940s until her death in 1995. This retrospective exhibition explores weaving as a living craft. Selected patterns by Herrick will be available on the web for weavers worldwide to interpret and share via Flickr. Five contemporary artists will participate in Museum residencies, creating personal responses to Herrick's patterns and adding to this traveling exhibition." Colorado-based author and educator Elissa Auther will be lecturing on Fiber Over Time: From the Sixties to Now in conjunction with the Laurie Herrick exhibition. "Drawing on her recently published String, Felt, Thread: The Hierarchy of Art and Craft in American Art, Elissa Auther will discuss how Laurie Herrick's weavings fit in historically with the decades in which they were made." 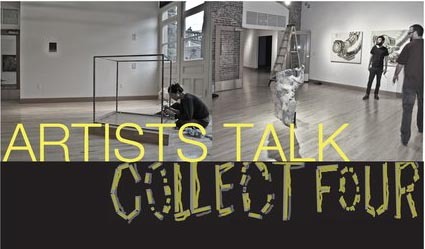 There will be an artist's talk today from 6-7 and your last 2 days to catch Collect Four: Scenes from Portland's Bleeding Edge at the U of O's White Box gallery (Portland Branch at the White Stag building). Curated by Jesse Hayward, the show features work by Matthew Green, Midori Hirose, Jason Traeger, and Ben Young. I reviewed Collect Four a couple of weeks ago and frankly if you don't know these artists you don't know Portland's art scene too well. Filmmaker, artist, and curator Bryan Konefsky is screening two shows with Grand Detour and presenting a workshop at the NW Film Center. The workshop is tonight 6:30-9:30pm and is on the subject Dead Tech Alive. Tuition is $10. Get the details on the NW Film Center website. The first film screening will be Happiness is a Warm Projector: Selections from Experiments in Cinema v1-v6, highlighting his work as a festival programmer. The second film screening will be I LOVE YOU LONG TIME: Bryan Konefsky *the early years* (1998-2010), featuring Konefsky's own work and some Q&A. More details on everything on the Grand Detour website. The Tasty Shorts film festival is also happening this week. Sponsored by the Art Institute, Tasty Shorts is a festival of short films. There were a lot of discussions about the Columbia River Crossing this weekend as things come to a head (again). New developments include the information that Pearson Airfield doesn't really pose much of an issue to building a taller/superior cable stay bridge. It is superior because that bridge type performs better in earthquakes, has a smaller # piers in the water and thus less environmental impact, plus becomes an icon spurring development for both sides of the river. Some characterize it as a merely aesthetic choice but seismic and environmental superiority plus the fact that the design is more pleasant for pedestrians and cyclists makes is a superior design which costs less than than the initially proposed bridge design (which was awful). This whole process has been backwards as PORT was the first to point out. Ethan Seltzer penned a guest article for the Oregonian (which tragically lacks an architecture critic). Hell even Vancouver's city council likes the cable stayed design. This process has been tremendously flawed (putting off the shelf bridge types above a true design discussion), but let's build the right bridge... we don't need the wrong one and building a horrible legacy for those who will have to suffer such a monstrosity in the future misses a great opportunity to re-imagine Portland and Vancouver's relationship to the mighty Columbia (and each other). Right now the only bridge that can bring everyone together is the cable stay design because it adds to the region rather than merely puts a transit band-aid upon it. Kitzhaber should listen to his base in Multnomah county, which has growing public support for the better performing cable stay design. And while he is at the project should hire a good architect to make certain the key design details are executed well, rather than in a perfunctory manner. Anna Lavatelli, "The Pink Room"
The Archer Gallery at Clark College is having their reception for Indweller, video works by Victoria Fu, Anna Lavatelli, Noelle Mason, and Lilly McElroy. "In each of these works, the bodies are used in a predetermined way within the space of the setting and the frame. The female figures are choreographed or set to a limited structure of movement, rather than used as character explorations. Through controlled gestures, constructed cinematic structures, and suspended moments in time and space, the figures become inseparable from the setting within the video, existing to complete the imagined world of the artist." 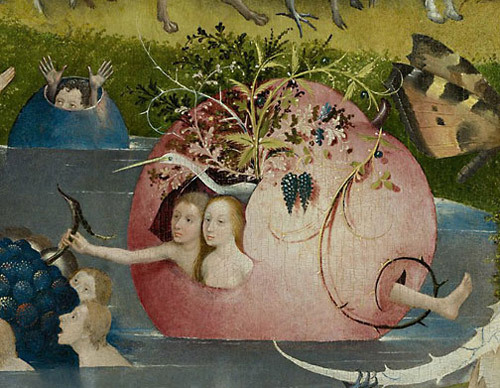 This year's Ostrow lecturer at Reed is Joseph Leo Koerner, who will be giving a talk on Hieronymus Bosch: Enemy Painting. Koerner is a professor at Harvard who specializes in German art. 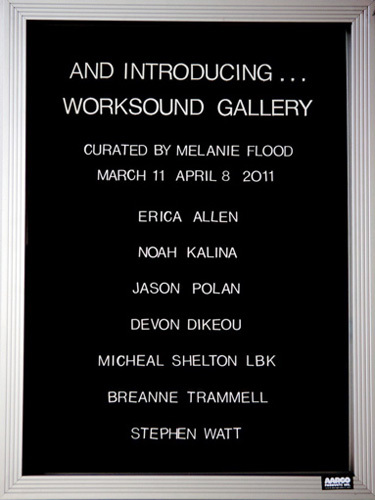 Worksound presents And Introducing..., curated by Melanie Flood and featuring work by Erica Allen, Jason Polan, Breanne Trammell, Devon Dikeou, Stephen Watt, Noah Kalina, and Micheal Shelton (the Longboard Kid), all out of NY. 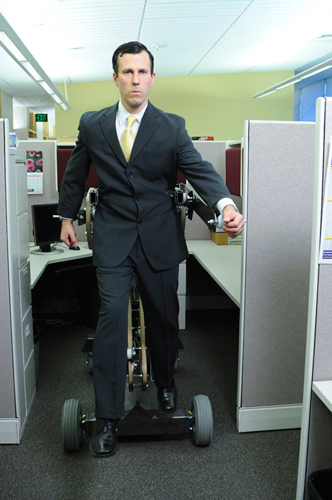 "And Introducing... breaks existing rules and invents brand-new ones. The show is polemical in how personal it is, conceptual in how random. These artists are connected by a strand twined together from creativity, experience, and life. They do their own things. They are not controlled, collected, composed. The artists of And Introducing... express, through photographs, drawings, objects, and ideas, a deep and true commitment to life under the creative influence." 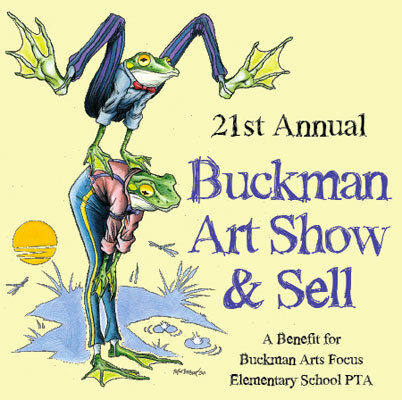 Buckman Arts Elementary presents the 21st annual Buckman Art Show & Sell. "This 21-year tradition features the original artwork of approximately 140 artists and craftspersons, including paintings, prints, photography, sculpture, ceramics, jewelry, textile, and other wearable art, toys, and much more, in a fun festival setting. A student gallery showcases the work of Buckman students and alumni." Come out and support one of Portland's great sources of public arts education. There's a $5 admission on Friday & a $2 suggested donation on Saturday. 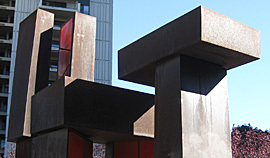 Lee Kelly, "Leland #1" (detail), 1975; renovated in 2010 with support from NEA and several private donors, featured in the RACC 2010 annual report. The RACC is giving their annual "State of the Arts" report to the City Council this Wednesday. Community members who want to attend need to RSVP to RSVP@theArtsCAN.org, or watch it live streaming on the City Council website. RACC's 2010 Report From the Community can also be read online here. PNCA presents Derrick Jensen for the 2011 Edelman Lecture. "Author, teacher, activist, small farmer and leading voice of uncompromising dissent, Jensen has been hailed as the philosopher poet of the environmental movement...Weaving together history, philosophy, environmentalism, economics, literature and psychology to produce a powerful argument and a passionate call for action, he points toward concrete solutions by focusing on our most primal human desire: to live on a healthy earth overflowing with uncut forests, clean rivers and thriving oceans that are not under the constant threat of being destroyed." Rocksbox presents No Painting Left Behind featuring Keith Boadwee, Erin Allen, Isaac Gray and Götulist í björg kassi! featuring Ásmundur Ásmundsson, Sigtryggur Berg Sigmarsson, Helgi Thórsson. 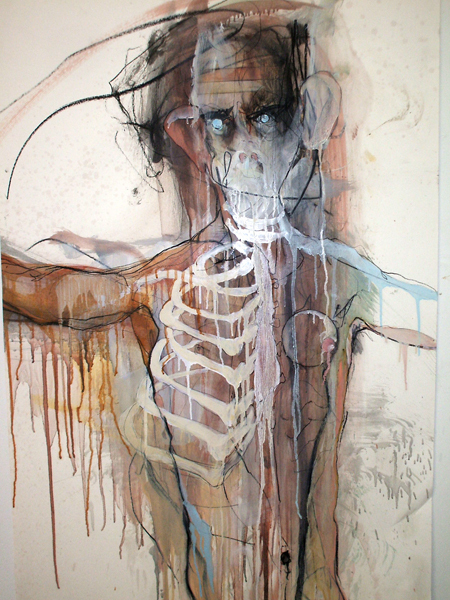 All works are humorous and radical explorations of painting. CNAA curator Bonnie Laing-Malcomson was interviewed by Eva Lake on Kboo yesterday. She's obviously still transitioning as she speaks in third person about "curatorial" as if it is a different department... look it's a steep learning curve, which we saw in February with the CNAA lineup. The question is if and how she can grow? The region is simply more engaged, challenging and diverse in its art production strategies... especially Portland (whom PAM needs to stay relevant to... especially when Tate Modern, The Whitney and MoMA have arguably played a bigger role locally). Seattle's Ambach and Rice gallery is moving to LA. There is definitely room for a new serious gallery in Seattle but there is a lot of competition with Portland galleries also showing Seattle based artists. The Oregon and Washington Governors have chosen a terrible design for the CRC (like the Marquam bridge, which many Portlanders want to demolish) and I urge everyone to check out this link and write their elected officials about the need for better design thinking rather than simple off the shelf engineering options. Portland's progressive thinking population will probably rise up in protest over this very ill considered choice. The CRC's own Design Advisory Group had much the same to say with this open letter. 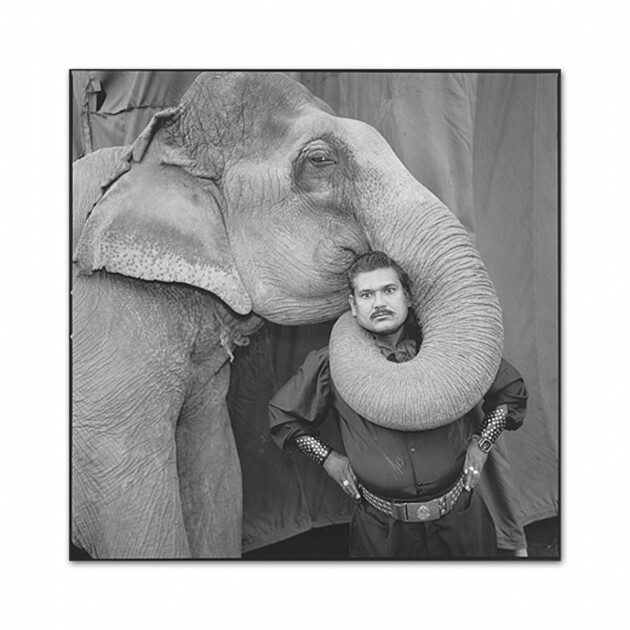 Blue Sky presents three series by influential photographer Mary Ellen Mark, Falkland Road, Indian Circus, and Ward 81. The images in Ward 81 were made at the Oregon State Hospital in Salem in the mid-1970s. 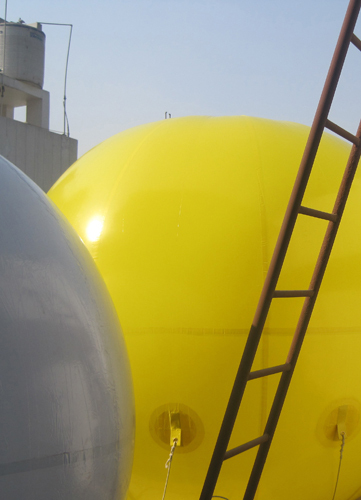 She'll be delivering an artist lecture on March 30 at 7pm at Reed College's Kaul Auditorium.